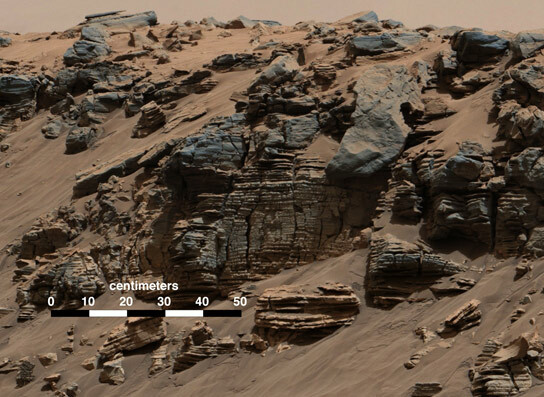 This evenly layered rock photographed by the Mast Camera (Mastcam) on NASA’s Curiosity Mars Rover on August 7, 2014, shows a pattern typical of a lake-floor sedimentary deposit not far from where flowing water entered a lake. New data from NASA’s Curiosity Rover indicate that Mount Sharp on Mars was built by sediments deposited in a large lake bed over tens of millions of years, suggesting ancient Mars maintained a climate that could have produced long-lasting lakes at many locations on the Red Planet. 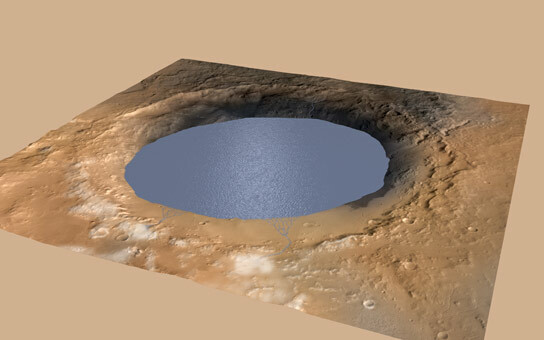 This illustration depicts a lake of water partially filling Mars’ Gale Crater, receiving runoff from snow melting on the crater’s northern rim. 1 Comment on "Curiosity Reveals Clues to How Water Helped Shape the Landscape of Mars"